Pianists, themselves, are not their own music. Like it or not, the music we make is fairly out-of-body. These thoughts pestered me twice this week: first, at Mission Dolores, listening carefully to the blooming contours of a solo bass singing plainchant, and then again last night, hearing Brian Sacawa's set at the Hemlock Tavern. For a vocalist, the music resides in the body--is produced through the body--and, in the best of situations, achieves a direct intimacy of expression. The music lives as much as the performer lives; this is only natural. The voice is not some separate entity from the body; to think that a singer is simply a technician cleverly or skillfully operating their vocal chords and diaphragm is to completely miss out on what makes music music. As a pianist, I am perhaps highly sensitized to the physical manifestation of sound, since the sounds I produce seem held at quite a distance from my body. Once, in the middle of a lesson, a piano teacher picked up a pencil and tapped the eraser from key to key. She said, "I can play this Bach with a pencil. Now you tell me, what's the difference between you--your fingers--and a pencil? Why should I listen to you when I can listen to a pencil?" (That was one of those go-home-and-sob-for-hours lessons.) There are two camps of musicians: those who use the breath and those who touch. (Those who play laptop or any stringed instrument are, I think, in the latter camp with us pianists and percussionists.) What we all have in common is how we use our ears. Lately, I find my ear straining to find ways to embody the music, to flow with the breath, to ... be more like a singer. Well, the Brink Series never fails to give me something to mull over. Dorsey Dunn wrapped things at the laptop, creating three varied soundscapes sourced from samples of his own saxophone playing. Reedy melodic figurations yielded to beats and drones and a random sprung guitar string. In a way, Dunn provided a thoughtful concluding commentary to Brian's earlier set. Thanks for a great evening, guys. Today, in an interview on PRI, composer Osvaldo Golijov was quick to respond to the observation that Ayre (just released on Deutsche Grammophon) traverses an astonishing range of vocal styles, from the quite classical to an almost inhuman techno-scatting. Golijov laughed and then described Dawn Upshaw's feats as that of a "vocal octopus." "Yes, yes...a vocal octopus." I swear he repeated this million dollar marriage of words; it can't be that I misheard him. Forget song cycles, give this boy a poet laureateship! The M.C. enters and sings his song, accompanied by the church organist--a pinch hitter still attired in his church wear. The M.C., on the other hand, is nattily dressed, in a tuxedo perhaps, or a fine Italian dress shirt and bright, modernistic tie. He swings a cane to and fro and formally reaches up to tilt his hat before speaking. M.C. : Welcome! Welcome! Ladies and gentlemen... oh, I thank you all for gathering here today, and I invite you now to settle down with your food, with your drink. Let us celebrate, entertain, be entertained; that is what this salon is all about. Salon? Yes, salon. What is a salon, you ask? Hmm... [He walks over to the piano, puts down his cane, and picks up a thick, weighty looking volume. He thumbs through it. He quotes imperiously.] A salon is... 'a periodic social gathering of men and women [he looks up and smiles at the crowd] who are representative of the fashion [pause] wit [pause] literature [pause] art [pause] and politics.' [He nods appreciatively, glances again at the big book, then looks out abruptly.] But a salon is also 'an elegant apartment or living room.' Ah yes. Think of Louis the XIV, the great Sun King, holding his gatherings in marvelously gilded and mirrored rooms. C'est magnifique! [muttering to himself] Salon, a salon. What is a salon? [with great intensity, he addresses an audience member] And what of the cabaret? The soiree? The shindig? [He thumbs through the great tome.] A cabaret is 'a tavern, a restaurant, a small club [smiling nostalgically] --as in France-- providing musical or [wiggles eyebrows suggestively] other entertainment. Audience member: [shouting] A cabaret IS the entertainment! A flamboyant young man emerges onto the stage from a set of French doors and nods confidently to the accompanist. I heard Gann's piece while listening to the local college radio station; it sent me into hysterics (and the car into the next lane of traffic. No, not really, but almost). It is brilliant. Playful and hilarious! Funny! Should I be reading his blog? When Augusta left it clad for the night in a new party dress for Rosamond or Kathleen, it often took on a sprightly, tricky air, as if it were going out for the evening to make a great show of being harum-scarum, giddy, folle. It seemed just on the point of tripping down-stairs, on tip-toe, waiting for the waltz to begin. At times the wire lady was most convincing in her pose as a woman of light behaviour, but she never fooled St. Peter. He had his blind spots, but he had never been taken in by one of her kind! 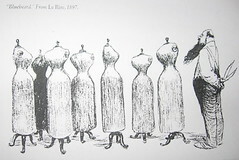 Needing neither clothing nor heads, the dress forms whirl from the wings of their own volition; their felt and wire figures spin between actors and then return to the curtain. The idea of framework is thus briefly--literally--suggested. In the wildly chaotic and precisely choreographed sewing shop scene in The Overcoat, those autonomous dress forms seem a fitting metaphor for the production itself. Without dialogue, the story is brought to life by means which more often play the supportive, accompanimental role, from the props and actors' physical gestures to the set and lighting design. Morris Panych and Wendy Gorling's creation hums with a vitality that usually lies just beneath the surface; here, the theatrical "cogs and wheels" narrate a story sans mot. As produced by the Canadian Stage Company, Nikolai Gogol's tale is given an early 20th century futuristic look: proletariats attired in black and white, or grey and brown, swarm through a utilitarian, two-storied set built along clean geometric lines. The lighting often reinforces this strict geometry, particularly in the sweatshop scene where each well-muscled "seamstress" is lit tic-tac-toe style, one grid-square at a time. Fueled throughout by the music of Dmitri Shostakovich, the actors' movements seem all the more motorific. I applaud the uncredited musical consultant who crafted the seamless score; waltzes from the Jazz and Ballet Suites merge with music from the two Piano Concertos, lacing social frivolity with an ominous portent. Everything--sound, lighting, set and costume--works together to heighten the dynamism of movement onstage. Sometimes a narrator needs no words. In this adaptation of The Overcoat, we watch the main character (The Man, played by Peter Anderson) endure his rather humdrum existence as part of the masses and wince when, almost on a whim, he decides to spend his life savings on a brilliant purple coat. The article of clothing initially seems capable of altering how people read him--he enjoys wine, women and song--but then the loss of the coat shatters the illusion. It is as if Gogol taunts, 'see what happens when you wish for more?' The production is much smarter than The Man, never wishing for (never needing) the artificial adornment of language. As Paynch remarks, "you could use words, but then the whole thing would become silly." The inner workings are enough; gesture and movement convey a narrative plot clearly and specifically. Whether bunched all together as if riding a crowded bus, or streaming endlessly across the stage at the wryly choreographed curtain-call, the actors celebrate what hides under the coat; they strip off the usual wordiness and expose a surprisingly animate (albeit silent) machine. The Overcoat, at A.C.T through September 25. Highly recommended. Our choir director lives for moments like this: from within the tenor section [in a very proud, lightbulb-going-off sort of voice] someone realizes aloud, "Oh, right! I see why we were ahead. We need to hold that note for six counts, not four." Uh-oh. Mr. Director hops up on the rounded, ornately-carved edge of the pew and perches there precariously as he begins his litany. "How many times have I talked about this? We never 'hold' notes. Notes are sustained, never held. You have to let them go, let them travel; sound is always moving, always on the go somewhere. If you hold onto a note, you prevent it from moving forward. Sustain, sustain! Give some direction to that note even as it is sustained on one pitch." The director often speaks quite passionately on the difference between holding and sustaining pitches, and tonight I envisioned another take on the issue. These notes we sing are like a little community of people, and you can't hold a person too tight for fear of extinguishing their creative impulses--their musical "movement" and direction, if you will. Yes, let them go, let them wander and explore. The best you can do is offer guidance, sustain them somehow, and give shape to their meanderings. Dear Palestrina. If I had to live in a piece of music...well, it couldn't get any better than that. The distance between the lowest and highest keys on the piano keyboard is 48 inches. The distance between San Francisco, CA and Mexico City is almost 1900 miles. There's hardly any comparison, I suppose, yet when one-half of Sidecar Syndicate departed for another nine months south of the border, the duo attempted to assuage separation anxiety with a musical analogy. "We'll be like left hand and right hands at the piano, sometimes far apart or practicing separately, but eventually getting back together and making our projects whole." Can working separately toward a common set of goals satisfy our collaborative needs? Can we provide support, encouragement, and criticism over such a distance? Most importantly, will we be able to stitch our individual efforts into a successful performance once we get back together? Hmm. One of us is skeptical. A pianist understands that in performance, the two hands must act as one; they must suggest one musical idea. The individual techniques--practicing hands alone, drilling some small snippet of right-left/left-right passagework, miming larger shifts of weight in broad, rhythmic gestures--isolate problem areas and train independence but always aim to serve the whole. Though it might sound contradictory, fiercely independent hands are best able to express a variety of ways of being together musically: supportive (accompanimental) or conversational (contrapuntal) or teasingly antagonistic. (There is a wry passage in John Zorn's "Carny" where one hand plays an E Major scale in contrary motion to the other's F Major scale; it's a no-hard-feelings kind of argument.) The piano hands are an excellent model, actually, of a duo relationship that is collaborative but not codependent. Perhaps Sidecar Syndicate can emulate that, working separately and still putting shows together in complex and varied ways. These next few months might not provide as much social satisfaction, but as Miss Anne pointed out, "there's always the internet!" I guess that means it's time for me--solo me!--to get to work. The phrase is scrawled throughout my old technique and repertoire books, "hands separately, hands together," and penciled variations are now just faded warnings: "hands alone, hands together," "left hand alone," "L.H. separately," "L.H. ALONE!!!" (The left hand had dependency issues.) The relationship between a pianist's hands--separately, and one to the other, and then together--is nurtured through practice and patience: learning the technique begins with scales, where the hands must first master separate fingerings but eventually play together in unison, while applying and refining the technique is forever a pianist's pastime. It is easy enough to play scales "hands separately," but the trick of putting them together is often what makes or breaks a beginning pianist. (Scales are sort of like fractions: you either get it or you don't.) With thorough training in basic technique (arpeggios, too), the two hands learn to function quite naturally as one bipolar unit; one hand can play wild filigree while the other remains rhythmically grounded, or the two can navigate complicated unison passages in perfect synchronicity, regardless of which individual fingers play which keys. The hands automatically negotiate their "separate" or "together" roles and allow the mind the freedom to focus on other musical issues. Until the figure changes...the left hand continues the phrase (prestissimo), but not necessarily the exact number of times or in the relation, to the right hand, indicated. Not in relation to the right hand? Well, the concept is clear enough, but sitting at the piano my hands cannot help but attempt to equalize the score, to gauge a distance with the eye and fit the two parts together approximately, or (worse?) to hear the left hand very metrically and let the right hand lazily fall into place. Ives is onto something, though, forcing the pianist to divide left from right: the one hand, "plunge[d] into the cool green dark" of the ocean, swims "against a cold turbulent strife." The song conveys its meaning to the performer literally--physically--and reminds one of that day just before being able to play scales "hands together," when each hand, still fiercely attached to its independence, fought against being joined to another. Although the song concludes with the swimmer's mastery of the pounding sea (a smug, three-hands-please D major pile-up reinforces the point), the best piano hands play a more graceful game of give and take: right against left against right, separately and together--together in harmony and homophony and together in dissonance and counterpoint. Struggling through the Ives reminds me of their remarkable relationship. The two hands seem disembodied at times, functioning separately--together--solely for the purpose of making this great music; no wonder pianists tend toward the neurotic!